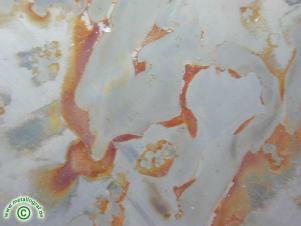 Obviously rusty spots could be seen at this plate surface. The material should be solution annealed. A microsection examination showed an austenitic structure with ca. 2% delta ferrite and a grain size of 7 - 8 . The increased quantity of carbide precipitations in the microstructure allowed the assumption that it is a not sufficient solution anneal of the plate. A nearer examination of the structure at the surface showed amplified tiny carbide precipitations on the grain boundaries. By the carbide precipitations the resistance against corrosion has been reduced drastically because of the chromium withdrawal in the environment of the carbides. Corrosion was the consequence.